Real Madrid have signed left-back Theo Hernandez from city rivals Atletico Madrid for a reported £22.8m fee on a six-year deal. The 19-year-old Frenchman failed to play for the Atletico first team and spent last season on loan at Alaves. He made 38 appearances in all competitions, including playing in the Copa del Rey final defeat by Barcelona. Meanwhile, full-back Fabio Coentrao has joined Portuguese side Sporting Lisbon on a one-year loan. The 29-year-old joined Real from Sporting's city rivals Benfica for £27m in 2011, winning both La Liga and the Champions League twice. He was absent with a thigh injury as Portugal won Euro 2016 and was left out of last season's Champions League final triumph over Juventus. Coentrao played 106 games for Real and spent a season on loan at Monaco. He is the second Real defender to leave the club this week after fellow Portuguese defender Pepe joined Turkish champions Besiktas on a free transfer. 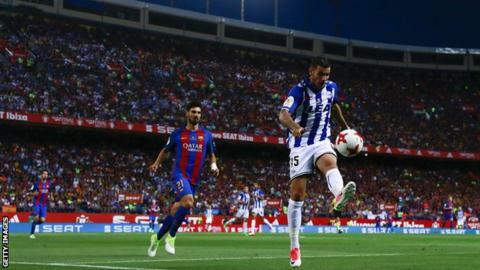 Last season, Premier League side Manchester City reportedly had bids for Theo Hernandez and his brother Lucas turned down by Atletico. The club said in a statement: "Theo, who was under contract until 2021, has rejected several times the offers of renewal from Atletico Madrid and the offers of different European clubs to hire his services, as well as stating repeatedly his firm desire to play for Real Madrid."